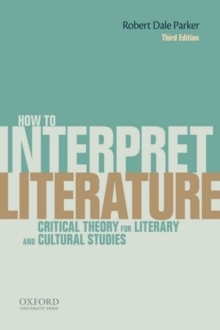 Offering a refreshing combination of accessibility and intellectual rigor, How to Interpret Literature: Critical Theory for Literary and Cultural Studies, Third Edition, presents an up-to-date, concise, and wide-ranging historicist survey of contemporary thinking in critical theory. The only book of its kind that thoroughly merges literary studies with cultural studies, this text provides a critical look at the major movements in literary studies since the1930s, including those often omitted from other texts. It is also the only up-to-date survey of literary theory that devotes extensive treatment to Queer Theory and Postcolonial and Race Studies.